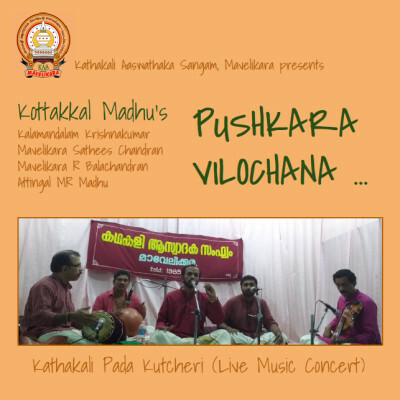 Pushkara Vilochana is a Live Kathakali Pada Kutcheri (Concert) led by Shri Kottakkal Madhu. The concert is a soulful and enchanting presentation of Kathakali Padams (kritis) in traditional Carnatic Padhatti with Raga Vistaras, Carnatic Swaras, Taniavartanam, Thillana etc. With great selection of popular kathakali kritis Ajitha Hare, Priya Manasa etc, this album is a musical treat for kathakali music lovers and carnatic music aficionados alike!